Don't look at the picture if you're squeamish. I have been having some strange symptoms since the holidays. It's kind of a chest pain and kind of like there's something in my throat or lower chest area. It's more of a discomfort that, by the end of the day, is sometimes exhausting. I finally went to a new Primary Care Dr. that I really like. Dr. Mark Ibanez of Ibanez Internal Medicine http://ibanezinternalmedicine.com/ . I would highly recommend him to anyone. He sent me to Dr. Jae Kim for an endoscopy thinking I have a case of GERD http://en.wikipedia.org/wiki/Gastroesophageal_reflux_disease from some of my symptoms. 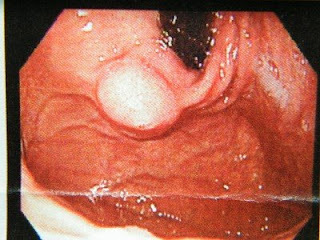 The endoscopy showed no signs of GERD or Reflux. They did it at Corpus Christi Endoscopy Center. It wasn't so bad after the IV was started. I ended up with my Mother taking me on short notice as Bruce is down with back problems. It was very nice having her there to help with the health history and we got some planning done on the upcoming Wedding Shower. It really took my mind off of my problems. It was a little intimidating going in to the surgical suite by myself and watching them bring over all of the equipment and strapping things onto my head. The worst was the little mouthpiece. It kept my mouth open and was very invasive to me. Luckily, it went on right before I went out. I have a very vague memory that's more like a dream of gagging and struggling for a bit. But it's so distant, I'm not sure it wasn't manufactured in my mind. I guess conscious sedation could allow me to have a memory of what happened. Anyway, I'm really not sure about the result as I was quite out of it when Dr. Kim explained it all. All I know is that I will be contacted by another Dr. to have the same (to me) procedure done at Spohn Shoreline where they are equipped to do an ultrasound and a needle biopsy of the thing they found in my stomach. I can't really make sense of how this thing is making the sensations I feel, other that it might be pushing on other things in my throat causing me to feel it. I thought it would be OK to put a picture of the thing here on my blog. I think the black thing is either one of the tools or the opening into my esophagus from the stomach.